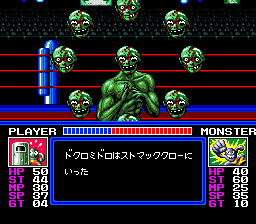 As wrestling video games grew in popularity in the early 90s (largely thanks to the Fire Pro Wrestling series, at least in the Japanese side), there were a few developers that tried to differentiate their titles by appealing to the supernatural. These included games like Telenet’s Beast Wrestler and SNK’s King of the Monsters series, which replaced real wrestlers with monster and kaijuu, respectively. 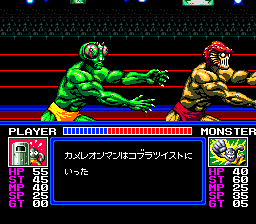 Monster Pro Wrestling, published by Ask Kodansha and developed by Lenar, continues along that minor trend, though from a gameplay perspective, there’s not much actual wrestling. In fact, there’s barely much of a game at all. 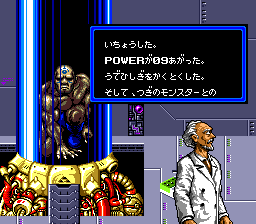 The premise is that in the year 1999, monsters have overtaken the Earth and driven the humans underground. 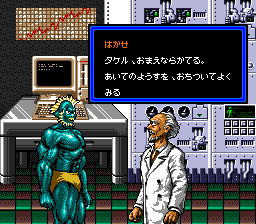 In order to prove their worth, one scientist takes his son and transforms into beast so he can compete in a wrestling tournament. There’s no real part of this that makes sense (least of all how transforming from a human into a beast proves much of anything), plus it’s made extra ridiculous given that the protagonist is named Yamato Takeru, a legendary Japanese prince. As an English equivalent, it’d be like naming your hero Galahad or Lancelot, despite having nothing to do with their original stories. 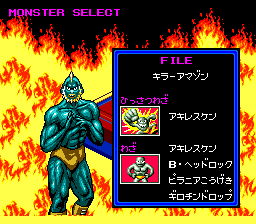 Anyway, in the game’s story mode, you can choose from four wrestlers: Killer Amazon (a fishman), The Ninja, Poison Man (a mushroom guy), and Macho Blue (who actually just seems like a really strong human). 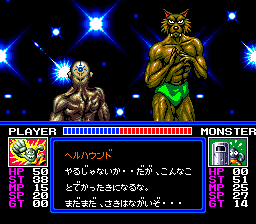 The two-player mode adds four more characters: Fly Boy, Death Bison (a minotaur), Power Hibagon (the Japanese equivalent of Bigfoot), and Great Death (a mummy). 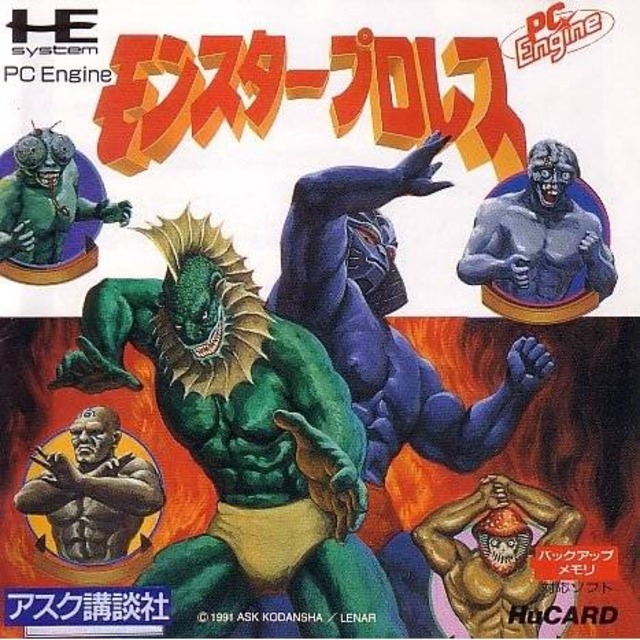 Computer controlled characters include Cyclops, Chameleon Man, and Hellhound (a werewolf). 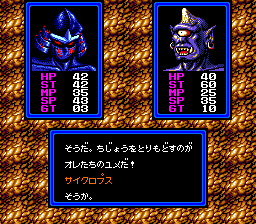 Their body types are identical across all characters, only color swapped and with different heads, likely a result of limited ROM space. 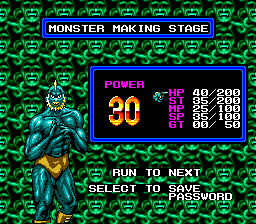 After picking a character, you can then distribute points into various statistics, like an RPG. Once you’re in the ring, you can only perform a few actions. 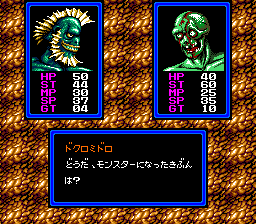 You choose a move by hitting left or right on the d-pad, then can optionally add “guts” points, a consumable pool that can add extra damage to your attack. Then you hit a button to begin a roulette. Then your opponent does the same thing. If your number is higher than theirs, you land the attack. If their number is higher than yours, then they hit you instead. 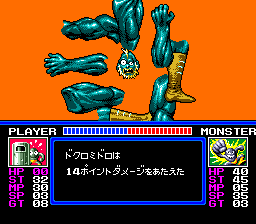 The attacks are shown via cinema animations, which take up a little over half the screen and are actually very smoothly animated. 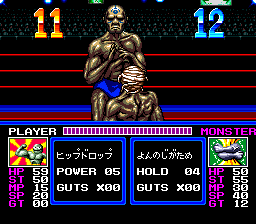 This setup wasn’t completely unheard of in previous wrestling games, such as Microleague Wrestling for home computers and Maniac Pro Wrestling for the PC Engine, which both presented wrestling action as a turn-based game. 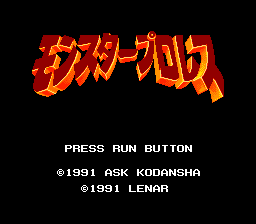 Moreover, this style was fairly popular due to the success of Tecmo’s Captain Tsubasa (Tecmo World Cup Soccer for the NES) series of football/soccer games. Most of these are presented in quick cuts, rarely more than a second long, sometimes showing full bodies and other times just focusing on specific body parts and movements. These are all ridiculously over-the-top, suitable considering the ridiculousness of the scenario. One of the standouts is when one pounds the other from above, causing their head to get knocked off. But don’t worry, he picks it right up and reattaches it, more or less good as new (minus whatever amount of damage it inflicted, of course.) 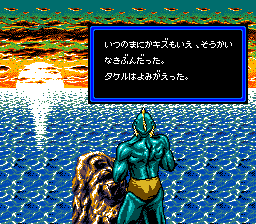 Most of them highlight the exaggerated facial animations, particularly amusing when one character has lost their roll and is about to be on the receiving end of some pain, or the gloating animations of the victor. 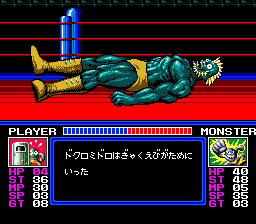 When a wrestler runs out of health, they literally explode, their dismembered limbs scattering in all directions. Despite sounding grotesque, there’s actually no real blood or gore, so it’s more like a cartoon than anything. 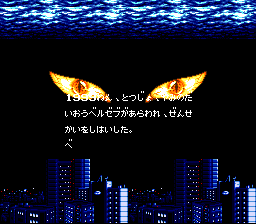 And that’s pretty much the entire game. The stats technically calculate the probability of winning an attack roll as well as the damage inflicted/taken, but the roulette numbers fly by so quickly that there’s no skill to it, so very little agency is given to the player during the match. Working through the story mode like this obviously isn’t much fun, especially when victory lies mostly in whether the computer feels like letting you win or not. Upon winning, you do get extra points and can take one of their skills. There are also passwords to save your character. 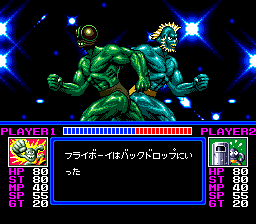 The two-player mode is at least a little less frustrating since some human player will come out victorious. 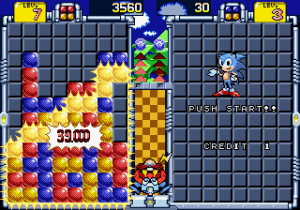 The appeal of the game lies entirely in the cinemas, and to be fair, they’re just stupid amount of fun. But there’s only so many of them, and they also get old quickly. 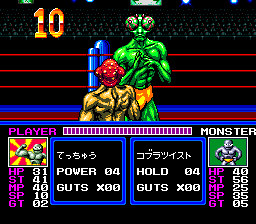 This is the sort of game you pull out for fifteen minutes to shock and amuse your friends, but really nothing more.